The F-104G was the main production version of the Starfighter with 1,122 aircraft produced as multi-role fighter-bombers. Manufactured by Lockheed, and under license by Canadair and a consortium of European companies which included Messerschmitt/MBB, Dornier, Fiat, Fokker, and SABCA. The type featured strengthened fuselage and wing structure, increased internal fuel capacity, an enlarged vertical fin, strengthened landing gear with larger tires, and revised flaps for improved combat maneuvering. Upgraded avionics included a new Autonetics NASARR F15A-41B radar with air-to-air and ground mapping modes, the Litton LN-3 Inertial Navigation System (the first on a production fighter), and an infrared sight. The selection of the F-104G as NATO's main fighter bomber was rocked by scandal when it was discovered that Lockheed (not for the first and not for the last time) had bribed political and military leaders to win the contract. So 'hot' an aircraft was the 104 that WWII ace Eric Hartmann was forced to retire from the Bundeswaffe after his strong and vocal opposition to the aircraft, which had a very poor initial safety record with the German Air Force. It eventually went on to have a good safety record. The last military Starfighters were retired from the Italian Air Force in 2004. Some are still being operated by civilians. Despite owning a number of these kits, I've only built one and found it to be a very positive experience. 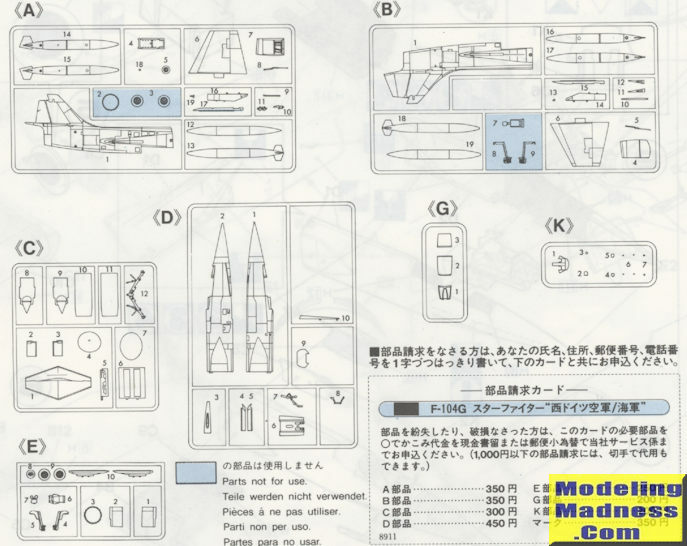 The kit is typical of Hasegawa kits from the 1990s until today. Finely engraved detail, a somewhat bare cockpit that uses decals and raised detail, and two seats. One is the type used by Canadian and Japanese Starfighters so is not used in this boxing. An interesting feature of the cockpit tub is that it has to be 'bent' along some scored lines to be the proper width. The nose section is separate from the rest of the airframe to accommodate the two seat boxings. The nose gear well attaches to the bottom of the cockpit assembly and intakes have no trunking, but are deep enough to make that almost a moot point. The rear fuselage section has a tailpipe assembly with the final compressor stage on one end and the burner can on the other. Note that throughout the build, the instructions will have you drill holes or remove detail as required. There is a main gear well piece that slides into the aft fuselage section just prior to installation of the nose section. The instructions show the gear legs in place, but it may be that you can attach these later so test fit it. The forward main gear doors are almost completely closed, but again, should not be attached until after the main gear due to the retraction struts. Wings and tailplanes are a single casting with holes already in the lower wings for the wing pylons. Missile and centerline tank pylon holes need to be opened up early in the construction. The kit does not include separate speed brakes, but really, these were frequently closed on the ground anyway. One has minimal options for things under wings. There are the tip tanks which were carried by pretty much all 104s and a pair of similar tands for the lower wing. No centerline equipment nor missiles. Clear bits consist of a windscreen, canopy and rear section. The canopy can be posed open, but there really is not much to see in the cockpit unless you go with aftermarket. 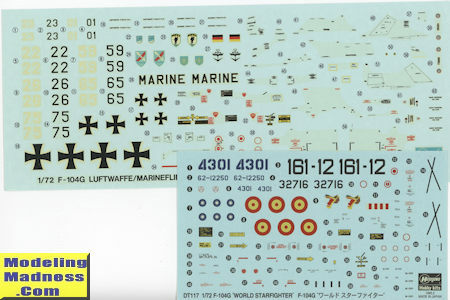 The kit provides six markings options. Four of them are German planes from the standard boxing that include aircraft from JBG 31, JBG 34, MFG1 and MFG 2. All the various schemes are included and Gunze paint references are provided. Two scheme are additional for this boxing and that includes a bare metal Spanish plane and an overall grey one from Taiwan. Decals are nicely printed and a bit thick, but even after 20 years, should be viable. I would have to guess that this is still the best F-104 kit in this scale. It builds nicely and there are a lot of aftermarket parts for those who want something different. Thanks to all the nations that have flown this one, there is a lot to choose from.